What behaviours and Conditions can Hypnotherapy help with? 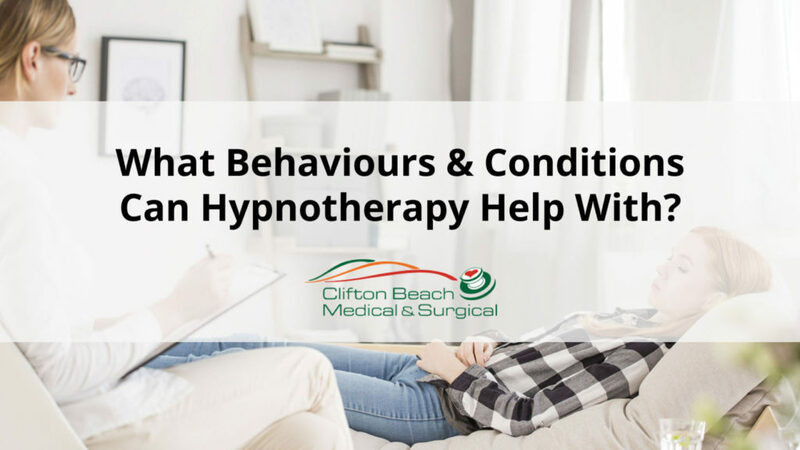 Dr Lindsay Martin from Clifton Beach Medical and Surgical talks about some behaviours and conditions that Hypnotherapy can help with. How does hypnosis help to treat certain conditions and disorders? Hypnosis can be used for instance to address certain addictions, to help us change a behaviour that we see within ourselves that we find unhelpful. In terms of therapy, hypnosis is also very, very useful in terms of anxiety disorders, we use hypnotherapy to provide a sense of calm, we use hypnotherapy to help somebody understand how to relax. We use graded muscular relaxation exercises as a means of demonstrating how to achieve calm. We can also use hypnotherapy in terms of many of our other disorders, disorders for instance around dislike of body image, we can use it in terms of anxiety about school, anxiety about the job, feeling overwhelmed. Hypnosis is very useful for instance if I’m repeating a pattern of behaviour that is unhelpful and I would like to change. One example that comes to mind, if I continually sit for an examination and I repeatedly believe that I’m going to fail and I do fail, I have developed a pattern where the thoughts beforehand are actually generating the failure. We can use hypnotherapy to alter that perception. We can use hypnotherapy to suggest changes in yourself, those changes can be incorporated into your feelings about yourself so that your behaviour in that circumstance changes. It will enable you to go and set your examination for instance and no longer be limited by the perception you’re going to fail. Does hypnotherapy help with relaxation? Hypnosis is also very, very helpful to learn how to relax, to learn how to achieve a state where you are calm, where you are calm at a physical level and an emotional level and also electrical level. What is the most common use of hypnotherapy at Clifton Beach Medical & Surgical? In this practice the most common use of hypnotherapy around improving one’s sense of self, so building up a positive identity. Looking at the sorts of beliefs one has already developed about themselves, ‘I’m ugly’, ‘I’m too fat,’ ‘I’m not good enough,’ ‘I lack confidence,’ ‘I haven’t achieved enough in my life,’ ‘something terrible is going to happen.’ Any of these sorts of very common cognitions, we call it, can be subtly adjusted with hypnotherapy. How does hypnotherapy help with negative body image? One example, I saw a teenage girl she came in worried that she was overweight. She said that she felt uncomfortable eating in public and she felt uncomfortable about her body image. What we used was a hypnotherapy script about body positivity. During the hypnosis, I encouraged her to get in touch internally with her body. We did several exercises of graded muscular relaxation, really focusing on enjoying the process, enjoying my body. I then also used the script about feeling confident, no longer feeling that people will judge me, always feeling that I was good enough. These were simple suggestions that were not specifically focused upon the body but was sufficient to improve her sense of self-worth and her confidence. In this instance, the therapy continued for several months, at fortnightly sessions. However, at the end of the sessions this young girl was confidently eating, felt good about her body weight, felt good about her body image and was progressing through school without any issues of anxiety. She no longer felt inferior to her peers and she was no longer responsive to the social media that often young girls see regarding the need to be a specific body type. Can hypnotherapy help with fear? I saw a young man at one stage and he was very, very worried about sleeping in his own bedroom. He was old enough to be sleeping in his own bedroom but he was actually really, really nervous about it. He had developed a fear that he would not cope in his own bedroom and therefore was often sleeping at the foot of the parent’s bed or outside of the parent’s bedroom door. We used hypnotherapy to help him move to that position where he was confident and capable of sleeping in his own bed in his own bedroom and actually felt really good about it. What I used was a story about a brave young boy who went into his own bedroom, recognised the wonders of his own bedroom, enjoyed the toys, the books and recognised the fact that he had actually designed his bedroom himself. In that hypnotic state, I introduced the suggestion that he was confident and would no longer feel fear to sleep alone. After two sessions of hypnotherapy a week apart the young man had confidently moved back into his bedroom was sleeping alone and had no further fears of being in his bedroom by himself. He was then able to go on camp with school because he didn’t fear sleeping alone. It made a huge difference without having to do too much and without medication. Can hypnosis help me give up smoking or stop unhelpful behaviours? If for instance, you may surf the internet, you may look through a newspaper, you may look through a magazine and there’s often these advertisements that say, “Give up smoking, one session, we will cure all,” these advertisements are questionable. Indeed we can use hypnosis to change behaviour, however, one of the most important things is hypnosis facilitates an awareness of your inner self. Through hypnosis, we can help assist change. We can use suggestions that will be taken into the depths of yourself to assist the change. If you don’t want to change your behaviour, hypnosis will not be effective. Can hypnotherapy help with trauma? Hypnotherapy absolutely can be used in terms of trauma. One of the uses for hypnotherapy is to actually build up a positive identity. We may use hypnotherapy in more complex cases to allow somebody to incorporate the identity features of someone for instance they admire. We use hypnotherapy to create a safe space for ongoing trauma work. We can use hypnotherapy to allow somebody to observe the trauma from a distance and work through this. We do not use hypnotherapy to dig in somebodies past. We do not use hypnotherapy to recover memories. I think it’s very, very important that unless this material is already something we have discussed, we do not use this to explore somebody. When we use hypnotherapy for trauma work it is not used at the beginning. Hypnotherapy, when we use it in terms of trauma work, is used after we have already explored the trauma, we have already worked towards that as a too later down the track. Hypnotherapy is often combined with what’s called EMDR, eye movement desensitisation and reprocessing therapy. Combining the two together is one of probably the most effective tools for working with somebody who has post-traumatic stress disorder. Can hypnotherapy be used for pain management? Hypnotherapy can also be used for pain. This is completely separate from the hypnotherapy we would use for anxiety or positive body image. In terms of hypnotherapy for pain, it is very important that we teach you how to hypnotise one’s self. We help you find your internal dialogue and focus away from the painful sight. We may use hypnotherapy to help you find the site of pain and adjust that within your mind’s eye. We can help you distract yourself and dissociate yourself from the pain so that it is manageable. There is evidence that people can be hypnotised to undergo surgery without an anaesthetic. The mind and our internal dialogue is incredibly powerful and we can capture that and change the way we feel pain. If you suffer from chronic pain, using self-hypnosis can be a means of managing the painful situation that you deal with on a daily basis. We can use hypnotherapy to help you understand your body to get in touch with those areas and change the feelings about those body areas. Self-hypnosis can be used in combination with medication obviously but it can also be used as a means of reducing the medicine that I am taking for my chronic pain. It can be used as a tool to move away from the usual analgesia. Is hypnotherapy effective for a person with ADHD? If somebody has ADHD inherently in that diagnosis is paucity of attention, therefore, it’s difficult to focus. Use of hypnotherapy when you have someone who has ADHD is difficult. It requires more of the technician, more of myself. I have to be more creative to actually obtain and capture the attention of my audience. In cases where it is difficult, we may use an alternative means of suggestion ADHD is not an absolute contraindication to hypnotherapy, all it means is inherently, it’s harder. If you would like to learn more about hypnotherapy, book an appointment today by calling one of our friendly reception staff on 0740591755 or click here.